Based on reviews from 274 experts and 8,181 users. 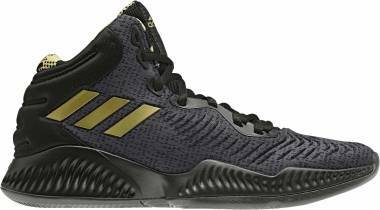 Learn how our rankings work or see our guide to Adidas basketball shoes. Updated Apr 2019. Adidas is founded by Adolf Dassler in 1948 in Herzogenaurach, Germany. The brand’s title was derived from its founder’s name— Adi from Adolf and das from Dassler. The Three Stripes logo was made a year later. It symbolizes the three products of the company: originals, sports performance, and sports style. The Trefoil. The Trefoil started in 1971 when Adidas debuted their leisure and apparel products. The leaves signify the landmasses of the Americas, Europe, Africa, and Asia, while the three horizontal lines mean diversity. It became the official company logo in 1972. The Trefoil is now used for the company’s Originals and Heritage lines. The Equipment Range. The Equipment Range debuted in 1997 when the Trefoil turned out to be a huge success. The shape of the mountain represents the obstacles and goals athletes have to face and achieve. Creative director Peter Moore designed the logo in 1990. Though it initially received a backlash for being too simple and dull, this logo has the most general applicability today. The Word Mark. The Word Mark came out in 2005. It symbolizes the brand’s dedication to quality, good leadership, and flexibility for the future. The simplicity of the logo made the brand easily recognizable. Adidas started producing basketball shoes in late 1969 and created noise in the NBA in 1970. 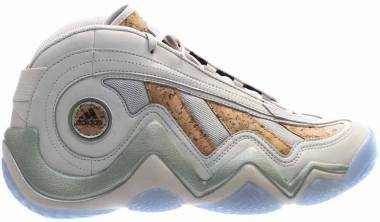 The basketball shoes Adidas released during that time were the Superstars. Even if there were no special technologies back when it was first created, the Adidas Superstar still comes out as a total game-changer. The shoe model has a “shell toe” on the forefoot, and it delivers durability and protection. Before it was worn on the streets, over three quarters of all NBA athletes had worn these Adidas basketball shoes, including one of the most prominent basketball athletes of the NBA Kareem Abdul-Jabbar who eventually became the company’s first signature athlete. The Adidas Superstar is considered one of the best basketball Adidas shoes of all time. Besides Jabbar, Adidas has signed other athletes for whom they have created profitable signature lines. The currently famous lines are for Damian Lillard, James Harden, Derrick Rose and newcomer Andrew Wiggins. Getting in the NBA is to fulfill not only a basketball dream but also the dream to have a signature line with huge companies. It takes a long and hard journey to be able to make it to the list of the top players in the game. Choosing an NBA star to endorse a huge company's basketball shoes takes more than just the scorecard. One has to go through a hard and long process before becoming an elite. Like they say, dream big or go home. Damian Lamonte Ollie Lillard, or Dame Lillard, is an American professional basketball player from Oakland, California. He has been a point guard for the Portland Blazers since they drafted him in 2012. Among his many awards are 2013 NBA All-Rookie First Team, 2013 NBA Rookie of the Year, 2014 All-NBA Third Team, 2016 All-NBA Second Team, and three-time NBA All Star. Aside from his basketball career, he is also busy being a rapper and hip-hop artist. He has released two albums. His signature shoe line is called Adidas Dame. Adidas D Lillard 1. Released in February 2015 at $105, the first pair of signature Damian Lillard shoes comes with Adiprene+ for cushioning. The midfoot is equipped with SprintFrame that provides reliable support, stability, and low-to-the-ground feel. For traction, the outsole of the D Lillard 1boasts the unbeatable herringbone pattern. Adidas D Lillard 2. 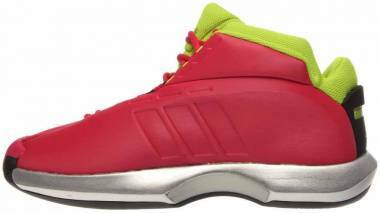 The second pair of signature Adidas basketball shoes for Lillard was released a year later at the same price. The cushioning system features full-length Bounce for continuous comfort. The non-marking outsole is made of Continental rubber for durability. Depending on the colorway, the D Lillard 2 has one of four different upper materials: Jacquard, Primeknit, synthetic leather, and knitted upper. Adidas D Lillard 3. 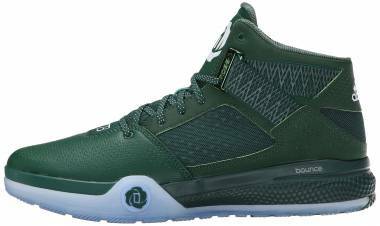 The D Lillard 3 was released in December 2016 at $115. It has full-length Bounce for flexibility, responsiveness, and enhanced comfort. The inspiration for the traction pattern comes from Dame’s childhood basketball courts. The brand debuted the FUSEDMESH technology in these Adidas shoes. This technology is made of lightweight TPU-based yarn that provides a customized fit. Adidas Dame 4. 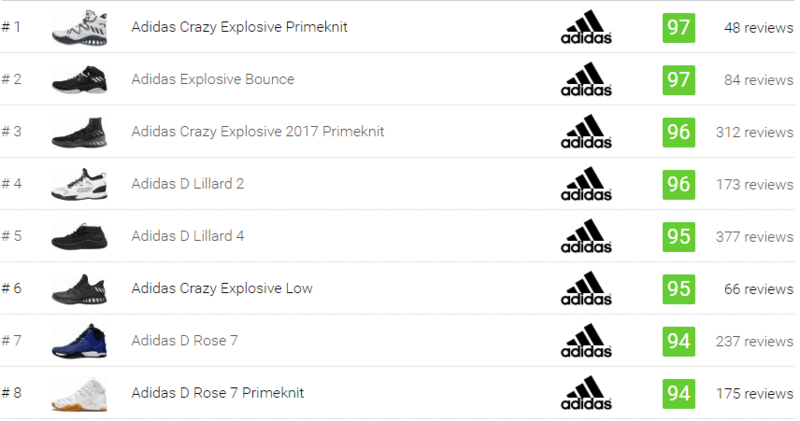 It was on October 6, 2017 when the fourth pair of basketball shoes Adidas produced for Lillard came out. Officially known as the Dame 4, it has a full-length Bounce that offers a low-to-the-ground feel. It also delivers decent impact absorption and responsiveness. To add a nice touch to the lace loops, they are wrapped with plastic materials that also ensures their durability. The numbers in the midfoot area add puzzling and interesting facts about Lillard’s life and basketball career. This fourth pair of Damian Lillard shoes is customizable through miadidas. Adidas Dame 5. Set to release in February 2019, the Dame 5 is reported to have a two-piece construction of mesh and suede. Prior to the official US release of these Adidas basketball shoes, two Chinese-New-Year-inspired colorways were released in Asia. Their upper is made of perforated and synthetic leather. The Bounce cushioning is caged by a thick rubber in the midfoot. It provides support and keep the foot from slipping out of the footbed. 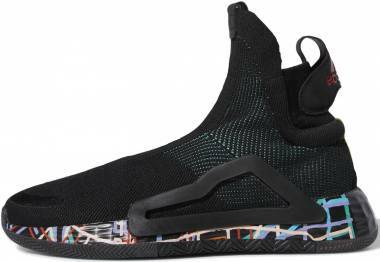 The ankle features a deconstructed knit collar for mobility similar to that of the Adidas Crazy BYW X. The outsole comes in a tried-and-true multidirectional herringbone pattern. Sneaker bloggers report the shoe to retail at $115. 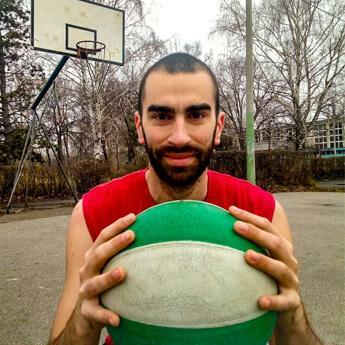 James Harden is a professional basketball player from Los Angeles, California. He stands six feet and five inches tall and weighs 220 pounds. In the 2009 NBA draft, he was the third overall pick by the Oklahoma City Thunder. He was traded to the Houston Rockets on October 27, 2012 after failing to agree to a four-year contract extension worth over $50 million. He inked a five-year contract with the Rockets worth $80 million, and he has then become their foundational player. Harden has many basketball achievements including being the NBA Sixth Man of the Year in 2012, All-NBA Third Team in 2013, three-time All-NBA First Team, and six-time NBA All Star. Adidas and Harden closed a $200-million endorsement deal that lasts for thirteen years. Harden Vol 1. 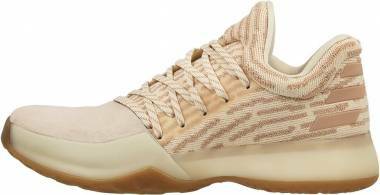 The Harden Vol 1 is the first signature shoe of James Harden. The shoe was released even if Harden was spotted wearing Swoosh shoes a few weeks after his Adidas contract was signed. The first pair of James Harden basketball shoes has received good reviews from the public. The traction pattern on its rubber compound outsole is inspired by the Fibonacci sequence. Adidas uses Aramis technology to map out pressure points in Harden’s foot and determine where he needs traction the most. The cushion consists of full-length caged Boost. The Boost in these Adidas basketball shoes is not as thick as other signature shoes. Instead, this model’s Boost is firmer, delivering a better court feel, superb heel-to-toe transition, and excellent impact protection. The upper is made of premium suede in the forefoot and PrimeKnit from the midfoot to the rear panel. The shoe is named Vol 1 because it was released in a lot of different colorways, which all draw inspiration from Harden’s life. These Adidas shoes were released in 2016 with a price range of $140 to $160. Harden Vol 2. The Harden Vol 2 will be released on February 15, 2018, just in time for the All Star Weekend. It boasts a one-bootie construction, and has a customizable lacing system for a snug fit and lockdown. 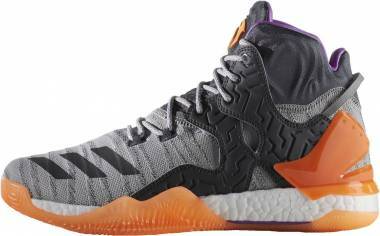 Boost is back with these Adidas basketball shoes, and it’s now thicker than the one in the previous Harden model. The upper is made of stitched mesh for durability. It features a stylistic Three Stripes overlay. 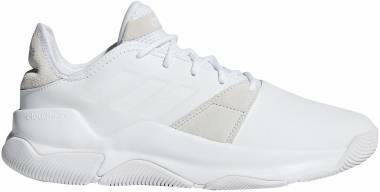 The midfoot and rear panels of the second James Harden basketball shoes are made of synthetic leather. Harden Vol 3. In June 2018, James Harden was awarded the NBA Most Valuable Player. Then on October 12, 2018, the Harden Vol 3 was released. It seems Harden has a really lucky year. The shoe model is tagged by the majority as the best Harden basketball shoe in the series. 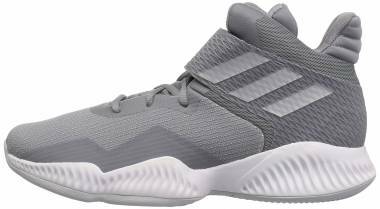 Its cushioning is so good it is considered the best Boost setup Adidas has ever had in a basketball shoe. To give balance to such greatness, the outsole comes with the traditional herringbone traction pattern. The breathable Flyknit upper has fuse overlays in high-wear zones for durability. As for the midfoot band, it is only for something aesthetic to look down to. Derrick Martell Rose,or more famously known as D Rose, is an NBA player from Englewood, Illinois. In the 2008 NBA Draft, he was the first overall pick of the Chicago Bulls. He stands six feet and three inches. He was named Rookie of the Year in 2009 at the ripe age of 22. In 2011, he took home the NBA Most Valuable Player Award. Currently, D Rose is a point guard with the Cleveland Cavaliers. Since Derrick Rose's rise to fame, he has had several endorsement deals with a pizza chain and a sporting goods company, to name a couple. As for the shoes, he and Adidas inked an endorsement deal for $1 million a year in 2008. Due to his injuries, he almost gave up on his career and almost compromised his Adidas contract. In 2012, Rose signed a contract extension with the brand worth $185 million for thirteen years. adiZero Rose 1. 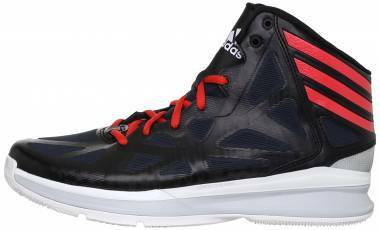 The adiZero 1 is the first signature shoe of basketball guard superstar Derrick Rose. It was released in October 2010 at $100 and tipping at 12.8 ounces. It has received good reviews from the public because of its flexibility, lightweight construction, breathability, and well-performing traction. According to Derrick, the basketball shoes Adidas designed for him is balanced in all aspects. The flexibility of the shoe comes from Sprintskin, which was designed by Robbie Fuller. Another prominent aspect of the shoe is the traction: the outsole has a thick rubber compound with PureMotion pods, which provide ease in changing directions and speeds. The Geofit technology and the design of the rear area contribute to the breathability of the shoe. adiZero Rose 1.5. 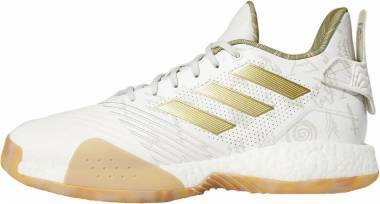 The adiZero Rose 1.5 is what Robbie Fuller calls the “half of the adiZero Rose 1.” It was released in February 2011. The shoe boasts the SprintFrame technology. It works with PureMotion on the heel and midsole to support the multidirectional footwork of the wearer. adiZero Rose 2. Made of premium and patent leather, the adiZero Rose 2 is arguably more luxurious than the Derrick Rose shoes that came before it. The Splatter Traction Surface aids the wearer’s indoor and outdoor performance by making easy the execution of cuts and crosses. The shoe model has thick and sturdy soles, but it is actually lightweight and weighs more or less twelve ounces depending on the size. The shoe model was released on November 10, 2011 at $110. adiZero Rose 2.5. 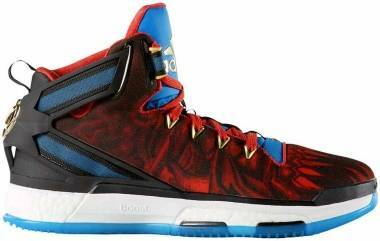 The adiZero Rose 2.5 was released on February 2, 2012 at the same price as its predecessor. For cushioning, the forefoot area is packed with a firm adiPrene foam. The heel has SprintFrame for impact protection. For additional comfort and support, the inner of the shoe is packed with a plush foam. As for ventilation, SprintWeb delivers airflow to the shoe. 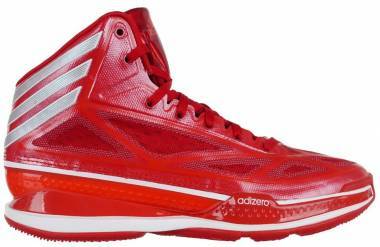 The other name for the adiZero Rose 2.5 is adiZero Rose Dominate. D Rose 3. The inspiration of the D Rose 3 is the Chicago Bulls. 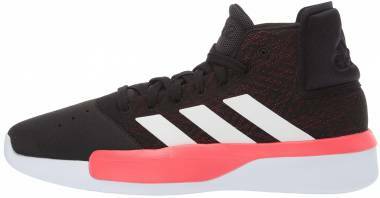 Unveiled on October 4, 2012, these Adidas basketball shoes come with full-length herringbone traction. Reviewers claim that once the shoe is broken in, the traction will have a solid surface. The upper is an upgrade— it is now a combination of synthetic leather and nubuck. D Rose 3.5. 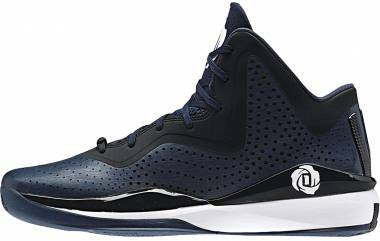 The first colorway of the D Rose 3.5 was released in January 24, 2013. These Adidas shoes share the same technologies with the previous model. The SprintFrame technology is excellent for heel lockdown. The SprintWeb in the midfoot gives the shoe a nice fit and comfort. The Geofit in the collar has bubbles in the foam, providing sufficient ankle comfort and support. D Rose 4. The D Rose 4 was released in October 2013 at $140. It comes with a minimal cushioning setup. It has an EVA midsole and an adiPrene crash pad on the heel. The outsole features the tried and tested herringbone pattern. 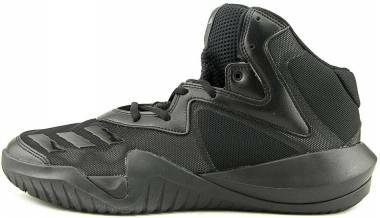 These basketball shoes Adidas produced can withstand outdoor courts without worries. To keep the foot in place, the GeoFit and SprintFrame technologies work well together. D Rose 4.5. The D Rose 4.5 has received spectacular reviews from the public. The traction of the 4 is carried over to the 4.5. Both indoor and outdoor gyms do not pose a threat to the durability of the outsole. The midsole has not changed as well. It is of the same structure with EVA and adiPrene crash pad. This setup is enjoyed by most guards for quick moves. As for the materials, a slight noticeable change is the addition of synthetic leather. 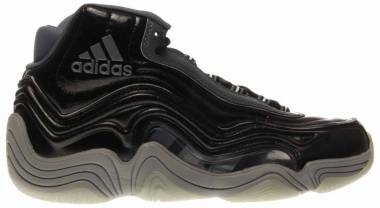 These Adidas shoes were released January 30, 2014 at $140. D Rose 5. The D Rose 5 is the the first in the series to have Boost. Unlike the ones in running shoes, the full-length Boost in these Adidas basketball shoes is firmer. Derrick’s footwork requires a shoe that provides stability and impact absorption, things that the Boost did not fail to deliver. The durable and perforated upper has SprintWeb in it to help wick away moisture. The release date for this shoe model was February 12, 2015. D Rose 6. The Chicago-inspired sixth signature shoe of Derrick Rose was made available to the world on October 15, 2015 at $140. Depending on the colorway, the upper is available either in Primeknit or a combination of synthetic leather and mesh. Once again, these Adidas basketball shoes scream Boost cushioning. 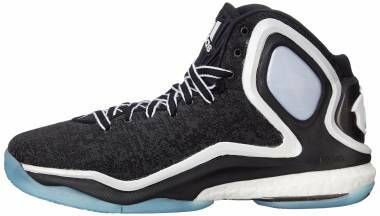 However, reviewers mention it is better than the D Rose 5 because of the assistance provided by the StableFrame as a carrier to activate Boost. The D Rose 6 has more than just a couple of features that provide support. The straps on the heel add a nice touch to the rear panel and give the heel proper foot containment. The wide base of the shoe prevents ankle rolls. The thick padding in the inner of the tongue gives the ankle comfort and support. This beast has a traction fit for playing on both indoor and outdoor courts. D Rose 7. The D Rose 7 debuted on August 12, 2016 at $160. These Adidas shoes with Boost gives a low-to-the-ground feel and highly effective impact absorption. Lots of wearers rave about the shoe’s traction. Indoors or outdoors, the D Rose 7 performs beastly and reportedly does not collect a lot of dust.The upper is made of synthetic leather and engineered with fuse overlays on the forefoot. For ankle support, the inner of the shoe has a thick padding inside a neoprene material. D Rose 8. 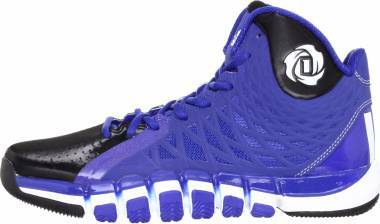 The D Rose 8 does not play as beastly as the previous ones but it is still a pretty decent shoe. The shoe’s traction pattern references the Great Chicago Fire that happened in 1871. The pattern has received mixed reviews in terms of how it performs. The upper consists of a combination of mesh and foam with fuse overlays, which provide flexibility to the foot. For stability, Adidas added a torsional plate to the shoe. These Adidas shoes with Boost were released on October 28, 2017. D Rose 9. The D Rose 9 is finally here. It was released on July 15, 2018 and retails at $140. For responsiveness and comfort, the shoe comes with a full-length Bounce cushioning. The exemplary grip and durability of the outsole is delivered by the Adiwear. The Primeknit upper provides a glove-like, lightweight, and cozy fit. Andrew Wiggins is a Canadian professional basketball player who is currently part of the NBA. He was drafted by the Cleveland Cavaliers in June 2014. For some reason, he was traded to the Minnesota Timberwolves in August without having played a single game with the Cavaliers. Because of his stellar performance, he won Rookie of the Year for the 2014-15 season. When his four-year rookie scale contract with the Timberwolves ended, he signed a $148 million five-year contract extension with them. According to Wiggins, he prefers mid-top basketball sneakers and he says he is not picky with the colorways. Crazy Explosive 2017 Primeknit. The Crazy Explosive 2017 Primeknit was released as a Player Exclusive for Andrew Wiggins. These Adidas basketball shoes are considered the brand’s best to date. They come in comfortable full-length Boost that satisfactorily provides impact protection. The upper is made of Primeknit, ensuring moisture-free comfort. Johnathan Hildred Wall Jr., or John Wall, is a 6’4’’ point guard of the Washington Wizards. He is from Raleigh, North Carolina. He was the first pick of the team in the first round of the 2010 NBA Draft at Madison Square Garden. His first signature line was with Reebok, and he made it to three shoe releases. He moved to Adidas and was immediately associated with the Crazyquick 2. The shoe model’s name matches his agile performance on court. Professionally, he has an average of 18.0 points, 9.0 assists, 4.5 rebounds and 1.7 steals in six NBA seasons. He is a four-time NBA All-Star. He also gets to his first All-NBA Team. Crazyquick 2. When John Wall jumped to the Three Stripes, he did not immediately get a signature shoe. Instead, he and Damian Lillard became the faces of the Adidas Crazyquick 2. The features of the shoe match John’s playing style. It comes with a multidirectional traction pattern which supports both the linear and lateral movements of the wearer. The EVA midsole delivers great court feel and agility. For ankle support, the shoe is equipped with SprintFrame and a padded GeoFit collar. J Wall 1. 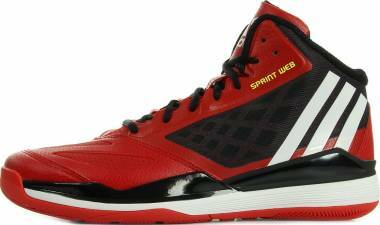 After a long wait for John Wall's first offcial signature shoe, the J Wall 1 was launched in October 31, 2014. It comes with firm and full-length Adiprene+ cushioning. The FitFrame technology wraps the shoe, providing a secure lockdown for side to side movements. The mid portion of the tongue has a loop that allows for a snugger fit . 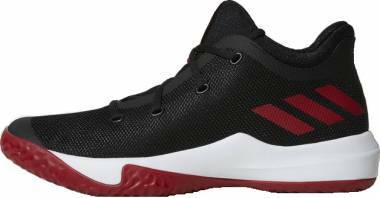 The outsole features a unique pattern that plays well on indoor courts..
J Wall 2. The J Wall 2 first appeared in 2015. 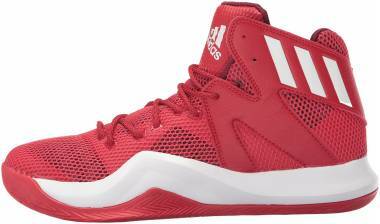 This pair of Adidas basketball shoes is the second and by far the most recent release in John Wall’s signature line. It features the WaveBone pattern on soft rubber, making it excellent for indoor plays. The midsole boasts full-length Adiprene+ cushioning. The material in the upper depends on the colorway. It’s either made of synthetic leather or a combination of synthetic leather and mesh. The shoe’s upper is equipped with the QuickFrame technology. 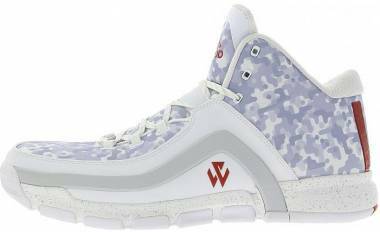 These John Wall shoes surely lock the feet down to support aggressive playstyles like John’s. Adidas Marquee Boost. John Wall’s contract with Adidas ended in 2015. Though his shoes “underperformed at retail,” the Three Stripes offered him an eight-year contract worth $66 million. He declined the offer and became a sneaker-free agent for the next three years. In 2018, he and Adidas entered a five-year endorsement deal. An Adidas Marquee Boost player exclusive was designed for him. With abstract designs in the outsole and ankle, the PE is dressed in a shock red upper with collegiate navy and cloud white detailings. Aesthetically, it features a mean and old-school vibe with a dainty white Boost midsole. 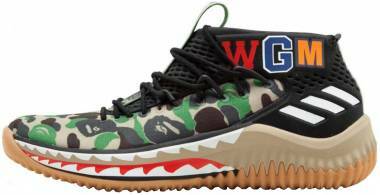 The shoe was released in December 2018 and retails at $140. Boost. Boost is the gold of Adidas cushioning systems. To date, it is the brand’s best midsole technology. It is composed of blown up thermoplastic polyurethane that looks like miniscule capsules, creating the styrofoam-like texture and appearance. It provides durability and the highest energy returns. Bounce. Bounce is a responsive foam that is best characterized as a firmer Boost. It has anti-collision protectors that keep the temperature from affecting the performance and quality of the foam. Adiprene. Adiprene is a cushioning material found just below the heel. It absorbs at least five times the weight of the wearer. Adiprene+. Adiprene+ is quite similar to the Boost and Bounce technologies. It is made of a very fim standard foam. It is placed beneath the toe piece, helping with take-offs. There are shoe models that have full forefoot Adiprene+. Cloudfoam. Cloudfoam is a cushioning system that provides high levels of comfort. It also absorbs shock well. Geofit. Geofit is a cushioning material that is strategically placed in the ankle collar to provide comfort and support. It is found in most athletic Adidas shoes because it meets the requirements of high-level performance. SprintFrame. SprintFrame is a lightweight technology for the internal midfoot. It provides stability and low-to-the-ground feel. It reliably supports the wearer’s quick cuts and take-offs. Primeknit. Primeknit is a digitally knitted fused yarn that is used as the main material for the one-piece uppers. It is lightweight, comfortable, and flexible. It is seamless and provides the foot with good support. The technology started in 2010 with a knitted glove made of thermoplastic fuse yarns. After presenting the idea to then Chief Marketing Officer Hermann Deininger, the team of Astrid Land, Martin Jobst, and Stefan Tamm were given twelve months to develop the sponsored project. The first Adidas shoes to have a Primeknit upper came out a year later, and they were limited-edition running shoes. SprintWeb. SprintWeb is a technology integrated to the upper of the shoe. It provides breathability and durability to the shoe model. Because there are not a lot of women basketball athletes who have signature lines, a good percentage of the basketball shoes Adidas sell are unisex. 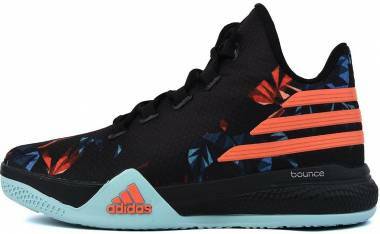 Some Adidas basketball shoes with Boost and Bounce are also available for women, such as the MI Crazy Explosive 2017, Explosive Bounce and MI Mad Bounce. Additionally, there are Adidas shoes for men that look and fit well the ladies. Before an athlete hits the court, she needs to get the perfect pair with the right size and cut. Sure, it is always good to fit the shoe and check out its design first before purchasing. However, not everyone has the luxury to do so. 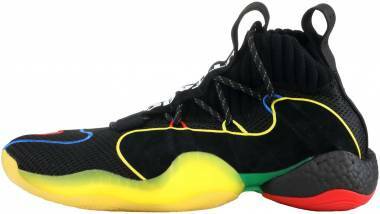 Besides, nothing can beat the deals for Adidas basketball shoes online, especially when buyers know when are where to look. How to get the right size online, then? The shoe sizes of each company vary, even with each shoe model. Adidas has a size chart intended for shoes and apparel, and the men to women conversions are clear there. While this is useful, this is not perfect science. But there is nothing to worry about when there is a mistake in picking the size because most online retailers offer free returns and exchanges within a specified number of days. However, this is an inconvenience to both parties. It is still best when orders are sure to create a pleasant online transaction. Brands have target release dates to make sure that the shoe models are noticed by the crowd, sneaker fanatics, and Youtubers. The trend is to align the release of the new models with famous occasions. All throughout the year, releases of new models or new colorways are targeted on holidays, annual observances such as Black History Month, or anniversaries of shoes. NBA All-Star Weekend. The NBA All-Star Weekend falls in the middle of February. It is also known as the All-Star Break for there are no regular games during this period. There are plenty of games during this festival but the main event, the All-Star Game, falls on the last day. It is one of the biggest events of the year in the world of basketball. NBA Playoffs. The NBA Playoffs happens right after the end of the NBA regular season. Also called as the NBA postseason, it involves the top eight teams of both the Eastern and Western Conferences. The tournament is a best-of-seven elimination to determine the champion of the season in each conference. The playoffs happen in spring. NBA Finals. The NBA Finals is a series of championship bouts between the champions of the two conferences. Whichever team wins the best-of-seven game series becomes the NBA champion. The arena is surely full and tickets are sold out. Who wouldn’t love a good price drop? Like others, Adidas shoes are also put on sale. Merchants and retailers take advantage of the holidays to increase their sales and get rid of older stocks. The days after Christmas and Thanksgiving are giving buyers a chance to grab their dream pairs at a lower rate. For buyers who don’t like the Christmas rush, these post-event price drops are the perfect reasons to go shopping. It is a tradition for most people to list down their resolutions and goals for the new year. They say, “New Year, New Me.” It is undeniable that the majority of the lists will include getting a new outfit, picking up a better lifestyle, getting a new haircut, and starting a workout routine among others. Shoe outlets put up sales that encourage the buyers to pursue their fitness goals for the year. A change in season means a change in routine. People like to go out and do some outdoor activities during spring. It is a time to get back in shape and be active again after the cold season. Retailers look forward to this season to put up sales that buyers should watch out for. By fall, students go back to school. Shoe outlets are busy marketing their previous releases at lower prices, perfect for on-budget students who need sports shoes for their athletic needs. The basketball shoes Adidas for sale are for every male and female, young and old. As winter approaches, the sales of retailers of athletic shoes drop as buyers shop for the cold weather. Outdoor shoes and apparel go on sale to lure customers to do extra purchases. The release dates of new shoe models are also to watch out for. During these times, outlets need to get rid of older models to have room for newer ones. These retailers go on inventory sales. There are even some who have a clearance sections that take 50% off the original price! There are buyers who love to have the latest models but are patient enough to wait for better deals; they reap their rewards during these times.